The perfect gift for a special occasion or for that special someone! 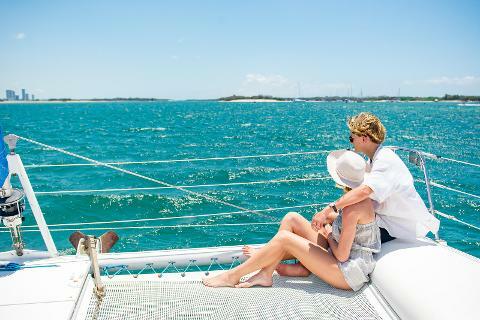 Enjoy the Gold Coast Broadwater at golden hour for a sunset sail aboard your own private yacht for 2 guests. Relax on the spacious trampoline style foredeck and enjoy a complimentary bottle of Chandon served by our friendly crew. We will capture photos of your experience and send these to you afterwards. The boat will be reserved exclusively for you and your special guest and the ideal opportunity to share an amazing memory. 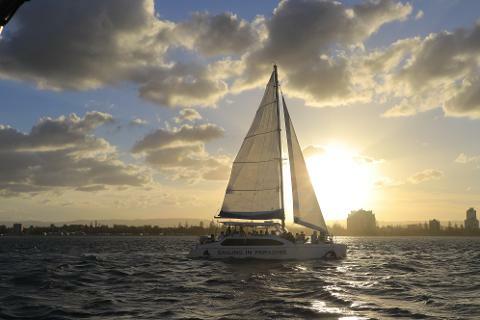 Sailing the calm waters of the Gold Coast Broadwater your guests will have the opportunity to take in the sights, the sunset over the mountains and the sparkling city lights by night. As this is a private charter your guests will be the only people on board (along with our crew) for the ultimate VIP experience. Guests are also welcome to bring along anything they wish in terms of food and drink or please contact us if you would like help with catering.